The Xavier girls basketball team has not lost a game in four weeks and is riding an eight-game winning streak heading into the postseason, matching their longest victory streak in six years. If the Saints can win two more games in a row, they'll finish the season at the Class 4A state tournament in Des Moines. 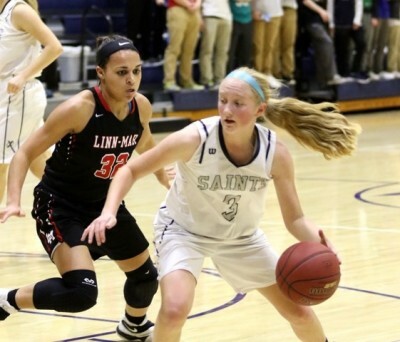 The sixth-ranked Saints held Linn-Mar to 16 points in the first three quarters Friday night and hung on for a 40-35 victory in the final game of the regular season at Ron Thillen Gymnasium. Xavier will take a 15-6 record into the regional semifinals next Saturday night at home and would host the regional finals on Tuesday, Feb. 21 if they are still alive. "I like where we're at, except maybe free throws," said Xavier Coach Tom Lilly after the Saints swept the season series from Linn-Mar for the first time in five years. The Saints finished only 11 for 21 at the free throw line, helping the Lions chop a 14-point deficit to only four points in the final stages before time ran out on the visitors. Linn-Mar got back into the game with a trapping zone defense that forced turnovers and left the Saints standing around too much, waiting for something good to happen instead of being aggressive. "We were holding on for dear life," said Lilly. It was an odd game in several respects. Only three players scored for Linn-Mar in the entire game, with Kamryn Finley leading the way with 20 points. And only four Saints scored in the contest. Finley, a 5-foot-9 junior who has committed to UNI, produced 57.1 percent of her team's points. "We did let Finley get loose, but she gets loose on a lot of kids," said Lilly. "For a lot of the time it was like we were battling only one kid." The Saints finished the regular season with a 12-4 record against Mississippi Valley Conference teams, including a 10-3 mark in league games that counted in the standings. That gave them second place in the Mississippi Division behind Iowa City West. The Saints also finished the regular season with a 7-1 record against Class 5A Metro teams. "I think at moments we're playing pretty good basketball," said Lilly, who has a week to prepare for the regional semifinals against Clear Creek Amana or Benton Community. The Linn-Mar Lions, conversely, will be lugging a six-game losing streak into the postseason tournament. The Lions finished the regular season at 11-10 overall and 7-6 in the MVC after getting off to a good start and cracking the 5A rankings. Linn-Mar scored only eight points in the first half, but the Lions stayed in touch by holding Xavier to 15 markers in the half. The Saints led 26-16 after three quarters and opened a 14-point lead at 30-16 on a basket by Caitlynn Daniels before the Lions fought back. Linn-Mar pulled within 35-31 on a basket by Finley with 1:22 left in the game and made it 39-35 on a bucket by Ally Johnson with 28.8 seconds left, but the Lions did not get any closer. Linn-Mar Coach Jaime Brandt liked some of the things she saw in the first three quarters, even though her players were not putting the ball in the basket. She thought the Lions showed better ball movement than in recent games. "You're going to think I sound crazy, but personally I actually was happy with our offense," she said. "I think in the first half we were a little timid, but once we find that balance of sharing the ball yet being aggressive, we're going to be just fine." Linn-Mar drew a first-round bye in the Class 5A regional tournament and will host Dubuque Hempstead in the semifinals on Saturday, Feb. 18. "Even though we lost tonight - and I've never said this in my life - but in my head it was almost a win for us," said Brandt, "because the way we've been playing, I haven't seen that fight and that grit from my team in over a month. "That's what we've been searching for." Kylie Brown led Xavier with 12 points. Daniels and Lexi Noonan scored 10 points apiece and Amelia Ivester had eight points. Ivester liked the way the Saints played in the first three quarters, especially with their "help" defense. "We played defense really well," she said. "We shared and passed together, and worked together as a team. And we weren't being selfish." Four weeks ago, the Saints were barely above .500 with a 7-6 record. Now they're heading into the postseason at 15-6 with an impressive eight-game winning streak. "It feels good," said Ivester. "We're excited." LINN-MAR (35): Printy 0 0-0 0, Miller 0 0-0 0, Spies 4 0-0 8, Johnson 2 3-3 7, Renner 0 0-0 0, Frese 0 0-0 0, Anderson 0 0-0 0, Murphy 0 0-0 0, Finley 8 1-4 20. Totals 14 4-7 35. XAVIER (40): Stanek 0 0-1 0, Daniels 4 2-4 10, Brown 2 7-12 12, Noonan 4 2-2 10, Steffen 0 0-2 0, Ivester 4 0-0 8, Jasper 0 0-0 0. Totals 14 11-21 40. Halftime - Xavier 15, Linn-Mar 8. 3-point goals - Linn-Mar 3 (Finley 3), Xavier 1 (Brown 1).